We’ve sung the praises of Spaceteam before. Henry Smith’s raucous creation is all about piloting a failing spaceship with a crew of friends, each of you feverishly shouting nonsense words in an attempt to keep the thing intact. Free, easy-to-use, and fun as hell, Spaceteam quickly became a multiplayer mobile-game standard. 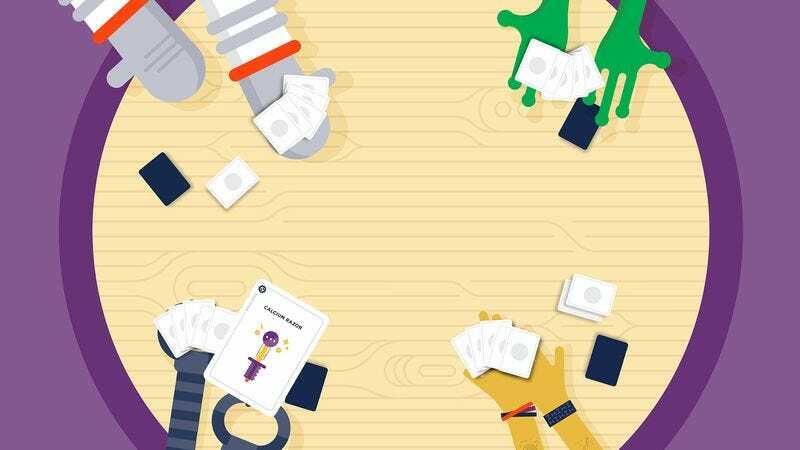 Now, a team of designers is working with Smith to adapt it into an equally lively card game, and they’ve turned to Kickstarter to look for funding. The basic premise is about the same as the original: Each player has a hand full of fantastical tools, and a stack of malfunctions in front of them that require two different tools to fix. Odds are that you don’t have both the tool cards needed to fix your current mess, so you’ll have to start asking your crew for them. Simple enough, but your space team only has five minutes to fix those malfunctions, find six “System Go” cards, and win the game—oh and there are no turns, so everyone is spouting sci-fi jargon at the same time. If it’s anything like its mobile inspiration, things can get messy and loud very quickly. The campaign has already raised more than $46,000, far beyond its initial funding goal of $7,500, and the team has several stretch goals it’s looking to hit with additional funding. A pledge of $20 will net you the base game, which its creators hope to ship by the end of the year, while $35 will also get you an expansion.